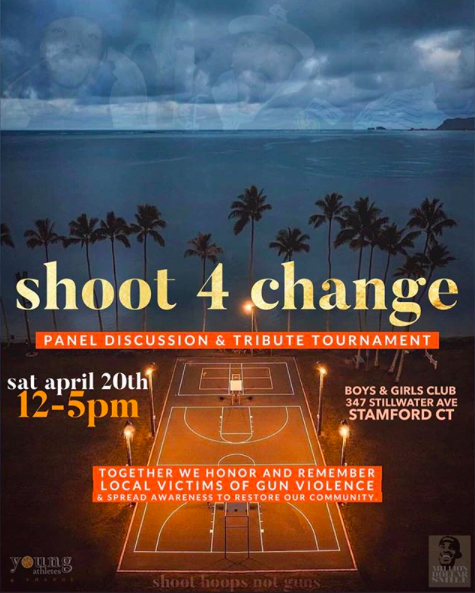 Young Athletes 4 Change, a Connecticut-based non-profit organization, is hosting “Shoot 4 Change” in Stamford, Connecticut on April 20th at the Stamford Boys & Girls Club to honor and remember local victims of gun violence and spread awareness to restore the community. The event marks the two-year anniversary of CT Native Max Antoine’s passing and will include a panel discussion followed by a tribute basketball tournament with special performances and more. Young Athletes 4 Change was founded by Wilner Popie Joseph. After losing his brother, Max, to gun violence in April of 2017, Joseph has committed himself to a quest for justice and call to action for positive community change. The urgent need to end gun violence on a national scale and this deeply personal loss propelled Joseph and his partner, Kaela Francesca, to transform their voices as educators and activists to focus on social justice, conflict resolution and peace building with their immediate youth community and within the Tri-state area. The organization, previously named Hoops4All, was recently honored as Non-Profit of the Night by NBA’s Brooklyn Nets and facilitates programs and events where social justice, activism and awareness are streamlined with basketball skill training and performance. Wilner believes that through empowering the connection between sports and civic engagement, we can collectively support our future generations. The event will take place at the Stamford Boys & Girls Club in Stamford, CT on Saturday, April 20th from 12-5pm. For more information, please contact Wilner Joseph at 203-898-2825 email at wilner.p.joseph@gmail.com or visit the Young Athletes 4 Change website at www.youngathletes4change.com.